Local radio personality, Sershin Narayadu is making waves on the local online radio, Megazone Hit Radio. The young man who is passionate about carving himself a successful career in the world of music as a DJ, and always made it a point to put his skills on display wherever he went, got his lucky break in 2017 and never looked back. Narayadu’s talents have since been internationally recognised and has built himself a large international following. Tabloid Newspapers spoke to Sershin about his interests and passion. Sershin Narayadu (SN): I’m 27-years-old and come from a family of five which includes my dad, Paul Narayadu, mum, Naleena, sister Santisha and my niece Neha. We are a happy go lucky family that enjoys traveling the world and experiencing new adventures. TN: Where do you hail from and where do you reside now ? SN: I am formally from Newlands West in Durban. My family relocated to Glenwood in 2005. TN: How did it all start for you ? SN: It all started at a young age when I took a loving to the 80s and 90s old school music. From then, I always said to myself I would like to learn how to Deejay. I started experimenting on two Hifi systems at home, which was fun and something I really enjoyed then my parents bought me a computer and downloaded a DJ Software where I started learning how to mix music live. In 2017, I met the CEO of Megazone Media, Vishal Maharaj at a concert in Durban where I was bodyguarding an international Bollywood artist, I approached him regarding my passion and he called me for an interview the very next day. After the interview, he granted me an opportunity of being a radio jock on the radio where I hosted my own show called the late night vibe and the afternoon drive show. In 2018, I was offered an opportunity of becoming a Radio jock on Megazone Bollywood and from there my career grew. I was then scouted by an international television station to do voice overs and advertising. This year, marks two years as a radio personality. TN: Is being a DJ something that you have always wanted to do? SN: Yes, I have always wanted to be a DJ. I have a great passion for the entertainment industry. TN: Who is your biggest inspiration in the radio industry ? 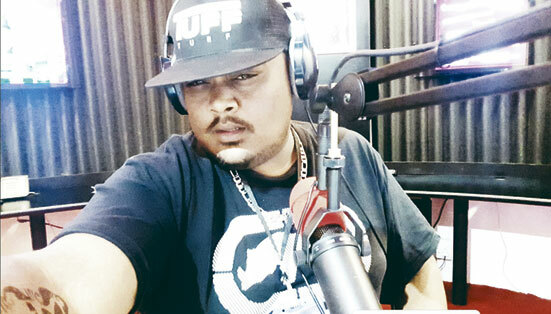 SN: My biggest inspiration is DJ Fresh whom I have learnt a lot from. TN: Where do you think the scene is headed (radio) five years from now ? SN: Radio has always played a crucial role historically as means of entertainment and communication across communities to bring people together and keep us abreast of local and international news as it occurs in society. If one has to look back more than 20 to 25 years ago technology has taken over our world quite rapidly. With platforms like social media and the internet the way we do things has changed. So too with radio now listeners can stream in to their favourite radio stations from anywhere in the world or listen to radio from a mobile phone which is quiet remarkable and is such a major step for radio and the role it plays in society. Within the next five years I would say that technology should be more advanced as it gets better everyday and online radio will be the order of the day. With people being able to access their favourite radio stations online it would mean that they are able to listen to their favourite tunes anywhere at anytime. I am definitely quiet optimistic about the future of online radio and it’s adaptations to keep up with the demands of it’s listeners with time. For me to be a part of it is something priceless as radio and entertainment is my life and to grow with technology affords me the opportunity that previous generations were not fortunate enough to enjoy. So yeah I’m quiet excited about the future of radio and see a demand for it more online in the next five years as society aims to keep up with the times. TN: Highlights of your career ? SN: The highlight of my career to date would be an international gig at a club in New York City in the United States. Also playing at the Moses Mabhida Stadium back here at home in Durban for a Bollywood fusion concert which gave me an exposure of being alongside international performing music artists in the entertainment industry. Those were truly special moments for me as it gave me the opportunity of showcasing my talent in an environment of international greats in music and entertainment. Those opportunities afforded me the chance to live my dream in doing what I love most which is music and entertainment. I also want to thank my mentor and a big brother, Bradley Bissessar who also mentored me and pushed me to take my talent to the next level. I want to thank him for always supporting me throughout my journey. TN: Where do you see yourself five years from now ? SN: I see myself as a successful individual, expanding my entertainment business and being South Africa’s best radio personality. TN: What advice would you give to aspiring DJs ? SN: Avoid negativity from society and always take your talent into the next level. Being a DJ, you always need to be different from other DJs and most importantly, have faith in your passion. Everyone can be a DJ but remember to always show the crowd what’s different about you. SN: The first day I went live, it was nail biting experience but thereafter I put the nervousness away and stayed focused. 10 minutes into my show, I felt like a superstar and from then I rocked the airwaves and did my utter best. TN: If you could eternally be stuck in one year’s music scene, which year would it be and why ? SN: The 80s, because the best music was made during this time and I simply enjoy it. TN: What is the one track that never gets old for you no matter how many times you hear it ? and the one song that got popular that you can’t stand ? SN: My all time favourite song is Kal Ho Na Ho a Bollywood song by Sonu Nigam, this song brings back a lot of good memories of special people in my life and further more it helps me relax my mind and I also fall asleep listening to it. A song that I don’t like is Happy by Pharrel William’s, it was popular on the chart show back then but as a DJ, I play this song as per request by guests in clubs and on radio. The song hasn’t been my favourite and surely doesn’t get me into a happy mood its title ‘Happy’ but doesn’t make me happy though. TN: Run us through a day in your life ? SN: My family and I run a business and I spend my entire day at the establishment on weekdays. On the weekends, it’s all about work on Megazone Bollywood FM and gigs at Stones uMhlanga where I am a resident DJ. TN: When you are not in studio, what else do you get up to ? SN: I MC and DJ at private events. I also love going out for movies with friends and family at the local malls and also spend my time playing on my playstation. I am also a huge football fan. TN: Are you involved in any causes/charities ? SN: I’m always part of a charity organisation in KZN. I also enjoy visiting kids homes because. I love kids and I want to do more for charity work in the near future. SN: I don’t have any pets. TN: Can you cook your favourite dish ? SN: I love preparing my favourite dish which is seafood pasta. TN: On which social networks can our readers find you ? SN: On Facebook: Sershin Deejay Desi M South Africa or on my Facebook Page which is DJ Desi M South Africa. Catch me on Megazone Bollywood FM where I host the Bollywood shows for Masti Nights every Friday between 6pm to 9pm and every Sunday for The Sunday Zone between 1pm and 4pm.